It refers to the presence of minute fat globules in the blood circulation. These globules circulate freely in the circulation and block smaller arteries and cause infarction of the organ supplied. Fracture of shafts of long bones; shafts of long bones contain fatty bone marrow. fracture is also associated with rupture of blood vessels at the injured site, hence some minute fat globule enter in to the circulation through the ruptured blood vessels. Fat embolism syndrome; it occurs in 1 %of individuals following skeletal injuries. 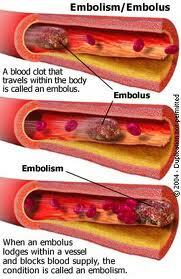 symptoms vary according to the site of emboli lodgment. Micro-aggregates of neutral fat cause occlusion of pulmonary or cerebral microvasculature and free fatty acids released from fat globules result in toxic injury to the vascular endothelium. this results in inflammatory reaction and thrombus formation that compromise blood supply of the organ involved and neurological and pulmonary symptoms appear. Myriad fat globules become coated with platelets. This results in platelets depletion and thrombocytopenia and this finally cause petechial haemorrhages.